The root of herbaceous plant Gentiana macrophylla Pall., G. straminea Maxim., G. crassicaulis Duthie ex Burk. or G. dahurica Fiseh of family Gentianaceae. The former three are usually called Qin Jiao and Ma Hua Jiao according to different characters, while the last one is often termed as Xiao Qin Jiao. Shaanxi, Gansu provinces and Inner Mongolia Autonomous Region, etc. of China. Special smell, bitter and slightly astringent taste. Big and thick root, fat duramen, brownish yellow in color and strong smells. Pungent, bitter, slightly cold; liver and gallbladder meridians entered. Dispel wind-damp, unblock collaterals to alleviate pain, reduce deficiency heat and clear damp-heat. Being pungent and bitter with the actions of dispersing and discharging, slightly cold without dryness, it excels in dispelling wind-damp, unblocking collaterals to alleviate arthralgia, and can be used with compatibility in treating all kinds of arthralgia syndromes due to wind and dampness, spasm of tendons and vessels and aching pain of scleromere no matter what disease condition is in, such as cold, hot, acute or chronic. Because of the predominant cold nature and the actions of clearing damp-heat, it is more suitable for heat arthralgia manifested by red swelling and burning pain of joints, and often combined with wind-damp-dispelling herbs and heat-clearing herbs, for example, Fang Ji, Luo Shi Teng and Ren Dong Teng. For arthralgia syndrome due to wind, dampness and cold, it should be combined with wind-damp-dispelling and cold-dispelling herbs such as Du Huo and Chuan Wu. Since the action of soothing tendons and collaterals, it can be used in treating windstroke manifested by hemiplegia, wry of eye and mouth, spasm of four extremities and aphasia with stiff tongue, and often combined with qi-replenishing, blood-nourishing, and stasis-resolving herbs, for instance, Huang Qi, Dang Gui and Chuan Xiong. 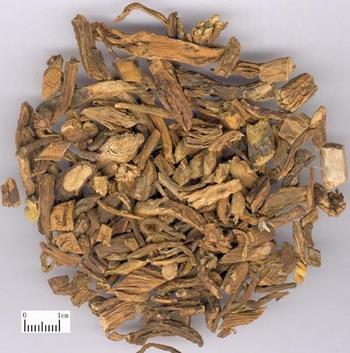 It is the commonly used herb for treating bone-steaming tidal fever due to yin deficiency because of the actions of reducing deficiency heat and relieving bone-steaming; it can be combined with yin-nourishing and deficiency-heat-reducing herbs: Qing Hao, Di Gu Pi and Zhi Mu are the examples. Being bitter and cold with the actions of clearing heat and purging fire, it can clear damp-heat from liver and gallbladder to alleviate jaundice. For jaundice due to damp-heat, it is often combined with heat-clearing and dampness-removing herbs, such as Yin Chen Hao, Zhi Zi and Da Huang when treating.